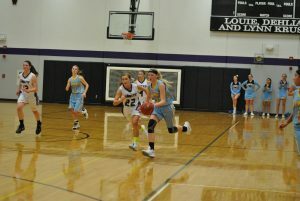 The L-S girls basketball team didn’t have too much difficulty on the road at Baxter on Tuesday, Nov. 21. The JV and varsity both came out with wins against the Bolts. The varsity girls won with a final score 67-39. The team has started off the season strong, improving to 2-0 after Tuesday night’s game. L-S Coach Jerry Hulsing said the Hawks again played with great effort. Junior Carson Fisk reaches up for a layup under pressure from a Baxter Bolt. Fisk finished the night with 20 points and 13 rebounds. Hulsing added that he’d like to see his team rebound the ball better and not get caught too far under the rim. The L-S girls found their up-tempo rhythm in the first quarter to go up 15-8 and pushed their lead to 38-18 by halftime. The Hawks finished the game strong. The L-S defense kept the Hawks in control for the majority of the game, only being outscored in the final quarter by two points. Junior Shiloh Cunningham led the team in steals with six. Sophomore Mallory Loftus crosses half-court ahead of her Baxter defender. Loftus had a solid night with 14 points and four rebounds. Strong performances were seen from junior Carson Fisk, senior Mariah Vos, and sophomore Mallory Loftus. Fisk led the team with 20 points and 13 rebounds, and Vos added 15 points and seven rebounds. Loftus contributed 14 points and four rebounds. 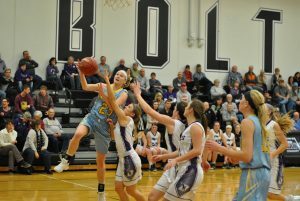 After beating Baxter, the L-S girls then had a week to prepare for a big rivalry game against the Montezuma Bravettes on Tuesday, Nov. 28. The girls will also be at North Mahaska this Friday, Dec. 1, for a quad. The varsity basketball teams also have a rare Saturday game this weekend at East Marshall. The JV girls looked sharp and improved on their shooting in their second game of the year last week. L-S beat Baxter, 52-32, on Tuesday, Nov. 21, in the last game before Thanksgiving break. Freshman Krystal Van Dyke had a double-double night with 10 points and 10 rebounds. She also had three assists and three steals. Freshman Megan Van Zante and sophomore Abby Gruver were the next top shooters with nine points apiece. Ninth-grader Cally Gibbs added six points off of two three-pointers.